With that in mind, here’s some things to consider when choosing reliable solar lights for heavy duty site illumination. Along with the detailed written materials, we’ve also included a video for those who prefer that medium. We know we write long, so we’ve prepared videos on Commercial Lights: one of which is high resolution, and one of which is reduced in size to play on smaller screens. We use the term Commercial Lights, but we do so carefully. The quality of solar lights continues to evolve. Often, we say “no thanks” when asked to sell lights new “commercial lights” based on a quick review of the product’s specifications. By the way, many solar lights marketed primarily to residential customers are fully capable of providing illumination suitable for business, institutional, and commercial sites. As consumers, you need to read the product specifications and, when necessary, ask the store for additional information or clarification. How much light does the fixture provide? How long does the fixture stay bright? What’s the fixture’s run time? Does the light have features to control how and when your site will be lighted: How does the fixture turn on, go off? Does it have circuitry to control how the battery powers the light, such as extending stored solar energy for as much light for as long as possible? Are there any special features such as motion-activation, timers, remote controls? How large an area will the solar light illuminate? This can be a tricky question and one that you may have to figure out on your own. If you’re not sure call or visit a store and describe the area’s function, size and characteristics. Large volume or large dollar purchases deserve a personal attention and you have every right to ask questions and to get answers. If your site is used by employees or the the public (and this includes managers of condominium or multiple unit residences), you have a higher level of liability than the average homeowner. 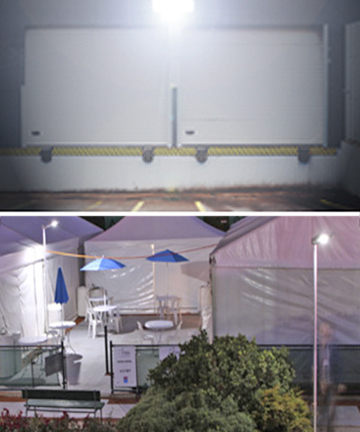 If lighting “invites” people toward an area; darkness implies an area is closed — it’s unwelcoming to say the least. A commercial site owner may be held liable if inadequate lighting causes an injury or an accident to say, employees or strangers who lawfully use the property. Homeowners also assume similar liability, but it’s also true that invited friends and family are less likely to sue than an employee or a stranger. A responsible store should let customers know if the lights they want to buy are inadequate for the intended purpose. When people call for discounts on large volumes of lights, we often recommend buying fewer stronger, more expensive lights and come up with a package that gives them appropriate illumination for the same budget. One or two quality more expensive commercial grade solar lights often provide as much, if not more quality and duration of illumination than several less costly lights. We’ll use the lights in the image as an example. These were picked because they are both good lights when used appropriately and they are from the same manufacturer. We could do the same thing with floodlights but chose as an example for an easy comparison. The solar lamp on the left sells for $99. The solar lamp on the right sells for $199.99. Let’s compare the technical specifications of the two lights. Lamp B, based on the strength and duration of the light, and its ability to sense when the battery is running low and automatically dim the light to stretch out the solar power stored in the battery that makes it run, is marketed as a Commercial grade light.Lamp A lacks these capabilties and is not marketed or meant for commercial use. It’s designed for private decks, patios, and entryways; it’s a quality lamp for residential use. While Lamp B costs twice as much, it provides about three to four times as much light. If you buy two lamps you pay $400, but get 700 lumens/80 watts of light. Four units of lamp costs just under $400, but you only 320 lumens/80-100 watts of light. While light bulbs are required by law to specify how much light they cast, this isn’t the case for lighting fixtures. It’s up to you to sift out fact from advertising embellishments. One thing you will see (because most people visualize light in terms of incandescent bulbs) is a fixture labelled by “lumens” and an equivalent to an incandescent bulb. Newer solar lights by good manufacturers usually specify how many “lumens” they emit. 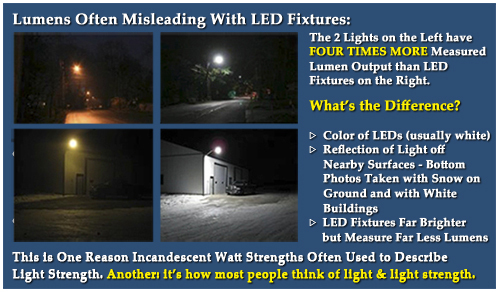 One glitch to this: lumens don’t always measure the true illumination of all lights, particularly bright white LEDs, where much of the “real light” is reflected rather than coming directly from the picture. Look at the photo below. The lights on the right are LED, and are obviously significantly brighter than the high pressure sodium lights on the left. BUT: the obviously dimmer lights measure 4 times (that is right four times) the lumens as the brighter LEDs. There are long scientific reasons for this, but the short reason is that LEDs work differently than other bulbs. The reflected light of well-made LEDs is not always picked up by the instruments that measure lumens. A manufacturer or store doesn’t really know how much light your site needs: you need to tell them. There are guidelines for street or sidewalk lights, but not everyone has FHWA guidelines lying around. 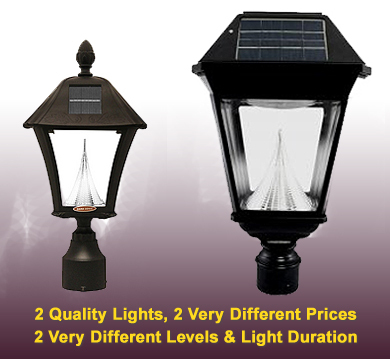 We also see solar lights marketed primarily to residential customers that have technical capabilities that make them fully capable of meeting commercial customers site, security, or parking area needs. Let’s put it this way: if you are adding lights for a walkway or area used by the public, you most likely need far greater illumination than you would for a private outdoor living area in your backyard. A good merchant should ask questions about who will use the area; what is done in the area; and your budget. You should feel comfortable that they understand your needs and the site’s requirements, not just that you have a budget and want as many lights as possible. Don’t ask the right questions, and you won’t get the right answers. And if you have trouble getting any answers or feel like you’re being given a sales pitch rather than valid information, go to another store. Technical Specifications: Is the solar light strong and reliable enough to serve provide safe lighting for public parking or recreation areas? Walkways, marinas or loading docks? Quality: Does the product have the basic components required for solar lighting in 2014? Reputation: The rapid leaps forward in solar lighting lighting mean that while there is indeed a lot more lousy solar lighting available than ever in the past, there are also a lot more quality fixtures. Your job: figuring out hype and facts. All Rights Reserved. No material in this post may be used without the express written permission of one of the above entities. This entry was posted in About Solar Lighting & Solar Products, Selecting & Caring for Solar Products, What's New and tagged commercial solar lights, intelligent solar lighting, know what to look for when buying commercial lights, solar facility lights, solar lamps, solar pole lights, solar security lights by SolarLightingSmart. Bookmark the permalink.